"Our findings highlight the need for tighter mercury emission regulations in southeast Asia," said lead study author, Dr Rowan Mott, a researcher in the Monash School of Biological Sciences. "Tighter regulations would minimise the potential threat to frigatebirds and other species dependent on marine resources including humans," he said. The research team used seabirds as 'bio-monitors', and assessed environmental trace metal concentrations in the eastern Indian Ocean, between North Western Australia and Indonesia. "We've been able to show that heavy metal burdens – namely mercury – in these birds almost certainly arises from Southeast Asia," said Dr Rohan Clarke, a study co-author also from the Monash School of Biological Sciences. "Mercury emission policy and enforcement must improve in southeast Asia," he said. Two breeding colonies in the eastern Indian Ocean were sampled: Ashmore Reef and Adele Island. 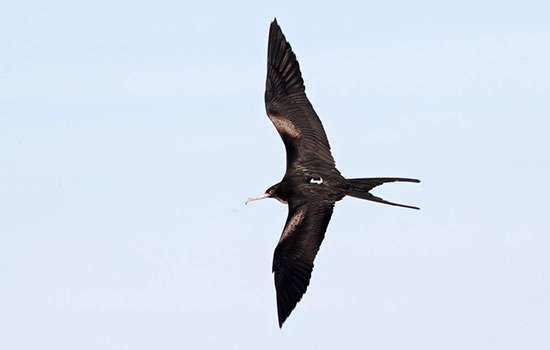 Both locations support large breeding colonies of Lesser Frigatebirds, small numbers of breeding Great Frigatebirds, and are recognised by Bird Life International as Important Bird Areas. The researchers looked for mercury contamination in the feather samples of 74 birds. "The results implicate mercury contamination in the marine areas of southeast Asia, and the South China Sea in particular, as a potential threat to seabirds," Dr Mott said. "The findings highlight the difficulty conserving species that range widely and cross international borders," he said.